The first annual Great Indian Developer Summit is almost over, but the .NET portion- "Bleeding Edge .NET"- has been over now for a couple of days. And now that I've made the 20+ hour journey back to the US from Bangalore (with a quick stop in the oh so hip Dubai), it's time to provide some final thoughts and follow-up. In short, for a first-year event, GIDS 2008 (at least the .NET portion of it) was an amazing success! There were about 1,000 developers in attendance for both days of the .NET sessions, which for those not aware of "average" .NET event sizes is incredible. 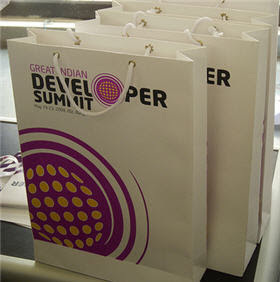 It solidly makes GIDS the largest .NET event in India and probably among the largest in that part of the world. If you didn't catch my earlier posts, be sure to take a moment and grab the slides and code I presented on days one and two. They are great resources for review if you're interested in ASP.NET AJAX, ASP.NET MVC, WPF, or Silverlight. If you're interested in pictures of this year's summit, be sure to check out the photos Jean-Luc David (MS Team System DE) posted to Flickr. He's also got a Bangalore set that features some of the speakers (yours truly included), so check that out if you've never been to India or are interested in seeing some speakers model for the camera. I think GIDS has a great future and I look forward to participating in the coming years. GIDS 09 planning is already underway, so watch soon for the dates for next year's event. For me, it's now on to TechEd 08! Thanks Todd for the wonderful sessions and posting the same slides and code snippet.